This magnificent 18th century Palladian mansion is surrounded by 36 acres of parkland designed by Humphry Repton, a leading 18th-century landscape designer. The beautiful grounds encompass a cascading river overhung by willows and crossed by pretty bridges, and a giant walled Victorian kitchen garden. 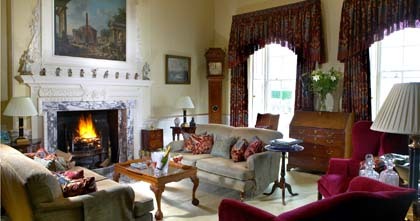 Now a luxury 4-star hotel, Ston Easton Park is captivating: pedimented doorways, marble fireplaces, elaborate cornicing, gilt mirrors, old oil paintings, fine porcelain and antiques fill the elegant public rooms. 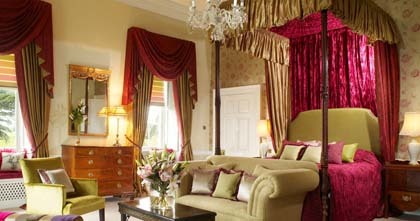 The bedrooms are generally large, many with 4-poster beds and a stay here will take you back in time to an era of opulence, yet despite the grandeur of the house, there is a very warm welcome, making guests feel they are part of a country house party. Click here to see the hotel website. There are 20 immensely characterful bedrooms which are traditional in feel and furnished with one-off antiques and wallpaper with eye-catching patterns – a man mowing a lawn in one room, Chinese prints in another. Contemporary touches have been carefully interjected into these historic rooms whilst ensuring the decor remains true to the building’s grand past.The en-suite bathrooms all have baths with showers over, except one classic room on the ground floor which has a wet room style open shower. Every room has complimentary wifi access, television, dvd player, hairdryer, toiletries and telephone. 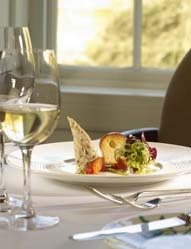 The modern British cuisine at Ston Easton has an excellent reputation locally with menus that use fresh, locally-sourced ingredients. The head chef works closely with local suppliers and even more closely with the hotel garden team, sourcing almost 60% of the fresh produce used in the menus from the hotel’s extensive kitchen gardens. For breakfast, there is a wide selection of hot and cold options, including a full english breakfast.